What a weekend in anyone’s book! I was privileged to fly my DC-3 to Marion, Indiana to participate in the annual Fly-In/Cruise-In event spearheaded by VAA member Ray Johnson. If you have not attended this fly-in you should put it on your list. It is a gathering of airplanes, tractors, cars, etc. that you will certainly enjoy seeing. We flew the DC-3 up from the Atlanta area on the Thursday before Labor Day arriving that afternoon. Saturday morning we set up our tent and began giving rides in the DC-3. We flew all day completing a total of 12 flights. 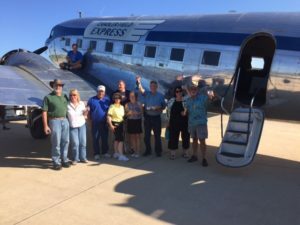 It was especially rewarding taking a few veterans for a ride – ones who had actually been crew members on the C-47 during WWII. Ray and his wife Judy made our trip very enjoyable. They went out of their way to make us feel welcome and to cater to our needs. It was a great time. 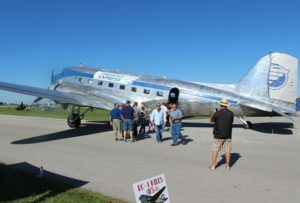 We loaded up the DC-3 early on the Sunday prior to Labor Day and flew 30 minutes up the road to Auburn, Indiana. There we were met by VAA President Geoff Robison and his group from Vintage Chapter 37. We set up shop and starting selling rides to people who were attending the annual Auburn-Duesenberg car show just a couple of miles away. The chapter 37 folks provided us with a great lunch including the best sweet corn I think I have ever eaten. It was great. Thanks to Vintage member Tom Waterhouse for cooking this for us. Great job. We were able to take a break from the flying and visit the Auburn Chord Duesenberg Museum. What an experience. I was blown away by the cars in that museum. This is another place you need to add to list of places to visit. It is hard to believe that pieces of metal can be formed in such works of art as displayed with those automobiles. Absolutely beautiful works of art. When we returned to the field we had a plane load of VAA Chapter 37 members who wanted to take an evening champagne flight. They had brought wine, snacks, etc. and they were all set for a nice tour of the area. We loaded up the 3 and took off with the group anxiously waiting for smooth air so they could begin serving. 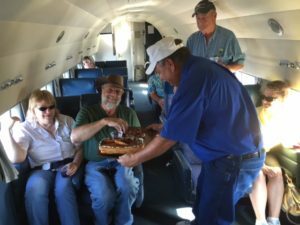 We leveled off and they were served snacks and drinks while enjoying the scenery looking out the window of a 1939 airplane. It was a great way to end our visit. We took off from Auburn that evening for our return flight to the Atlanta area. It was the end of a great weekend of visiting with friends and fellow antique airplane enthusiasts. We were able to provide an experience of flying in an old airliner to a number of people. All of them seem to enjoy it very much. Seeing the smiles on their faces and being able to share this experience makes all of the hours and dollars spent on maintaining this airplane worthwhile. We hope to return in September, 2018. Go to www.flyincruisein.com for more pictures and information.